Some of you may remember the CLEGourmand series from 2010. I was given the opportunity to head back to Cleveland again as a guest of Positively Cleveland so I (@CMHGourmand) will be Tweeting up a storm from Thursday October 4th to Sunday October 7th describing my #CLEGourmand adventures on #TourCle with @PositivelyCleve. The staff did take a moment to clarify that I would be going back to some of the same places as last time including Greenhouse Tavern, Lucky’s, The Rock and Roll Hall of Fame and The Cleveland Museum of Art. My response to that was a hearty, YES! – I would love to revisit any place from the 2010 trip without a hesitation. They say you can never go back, well I say you can go back to Cleveland any time and enjoy it just as much if not more than before. I will be joined by several other writers from around the country as we eat from dawn to dusk…while appreciating the thriving arts community of Cleveland. While I did not need any convincing, I did read through the press release soliciting writers and think they made the perfect pitch. I am going to share some the highlights of the Positively Cleveland email below. They did a great job showing off what the city has to offer. 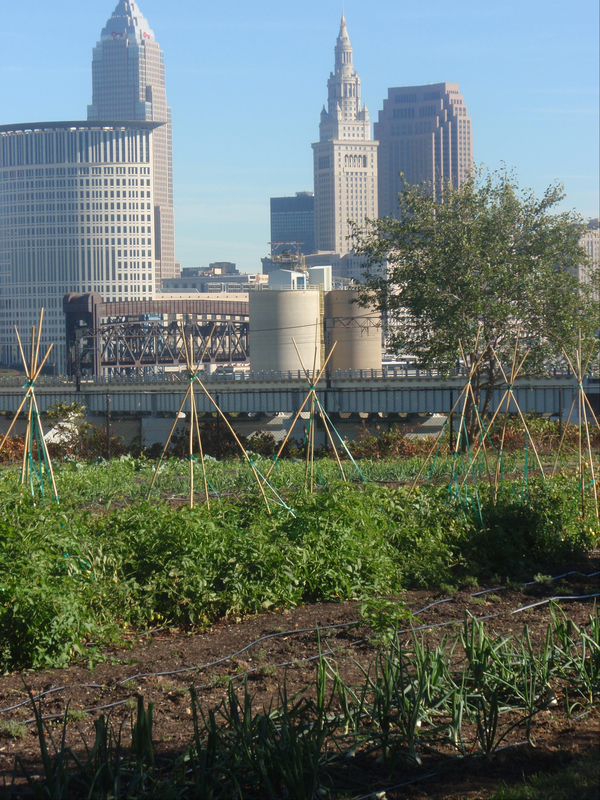 CLEVELAND, OHIO – The charm of urban markets attracts tourists to a number of cities. The growth of hot new restaurants adds to the foodie mystique of a handful of communities. Cutting-edge museums attract fans in droves. But few cities across the country can boast all three tourist attraction elements with the pedigree of those in Cleveland. * Cleveland’s renowned West Side Market is celebrating its 100th year of providing quality ethnically diverse food including fine cuts of meat, seafood, fresh local produce and baked goods. With over 100 vendors there’s something for everyone. * For years, Cleveland chefs and restaurants have been writing the ultimate Cinderella story as they win celebrity status with recognition by the James Beard Foundation, appearances on “Best Restaurant” ranking lists and airtime on the nation’s most loved culinary television shows. * This fall, Cleveland’s ($26.3 Million) Museum of Contemporary Art celebrates its grand opening in University Circle, a unique cultural center that also is home to the Cleveland Orchestra, Institute of Music, the Cleveland Museum of Art, Case Western University and more. These features provide a true “Palette to Palate” experience for tourists seeking a quality cultural experience for an affordable price. With its iconic Seth Thomas (the same folks that did the one at Grand Central Station) clock tower, the Guastavino tile vaulted ceiling and red quarry tile floors, it would be enough to label the West Side Market as an architecturally-important and stunning building. But, ask any local, visitor or chef and they will tell you the 100-year-old market is so much more. As one of the nation’s oldest public markets, the West Side Market was once where 20th century immigrants found the foods and spices of their homeland and were able to celebrate their cultural heritage through the art of cooking. Today, it retains its bustling charm while offering a unique shopping experience for fresh foods, rare ethnic ingredients, local produce and more. With more than a dozen ethnicities including Polish, Greek, Irish, Mexican, Slovenian and more; as well as locally-produced pastas, tortillas, artisanal cheeses; and specialty foods such as a whole animals (pig, goat and lamb), chicken feet, alligator and headcheese, there is something for the more than one million visitors who experience the West Side Market each year. The true authenticity of the market comes from the two legacy vendors, the Wincek & Stumpf and the Leu families, who have operated stands at the Market in some form since 1912; the Fernengels and produce vendors who have passed the stand down through three and four generations; Maple Valley Sugarbush and Annemarie’s Dairy who feature locally-sourced products; and Campbell’s Popcorn and Orale! who have seen so much success they’ve expanded to storefront operations. There is a story behind every booth at the West Side Market and it is these people who make the market the “Best Food Lovers Market” in the country by Food Network Magazine. Museum-of-Contemporary-ArtIn a town where the traditional arts are rooted in the riches of the early 19th century, it would be easy to question where modern art fits in. For the first time in its 40-year history the Cleveland Museum of Contemporary Art makes a major splash with a new $26.3 million street-level building, open Oct. 6. At the intersection of Cleveland’s classic cultural district, University Circle, and the emerging Uptown District sits the 34,000-square-foot, four-story building, the first in the country designed by Farshid Moussavi Architecture. The new facility, itself a work of dramatic geometric art, provides MOCA the space for a diverse array of innovative flexible exhibitions, programs and the art of our time. It is expected to draw 65,000 visitors within its first year. The first year of exhibitions, led by Chief Curator David Norr, incorporates a dynamic range of contemporary art, taking full advantage of the Museum’s expanded capacities and unique structure. The exhibition provides an in-depth look at how contemporary art engages with architecture and concepts of space. There will be a focus on new and commissioned work, giving audiences access to diverse artistic processes through site-specific installations and performances. The inaugural exhibition, Inside Out and From the Ground Up features major commissions by Katharina Grosse, Henrique Oliveira, and Barry Underwood, and new works by David Altmejd, Jacqueline Humphries, and William Villalongo, among an international roster of 13 artists. The highly anticipated opening of MOCA will feature a three-day long celebration with activities for museum members, out-of-town guests and the general public. HEX, a three-tiered all-night party featuring musical performances and DJs will kick-off the opening on Saturday night. Sunday is reserved for members-only access. Monday, Oct. 6 will feature free museum admission for the public as well as a variety of family-friendly activities. For more information visit http://www.mocacleveland.org..
A number of Cleveland-area restaurants follow Mother Nature’s lead and create rotating menus that feature the best of the current harvest. And, with a premium Midwest location and climate, culinary resources such as the West Side Market and the regional accessibility of Huron’s Chef’s Garden, area restaurants and chefs have a knack for featuring fresh, seasonal dishes grown in their own backyards, literally and figuratively. The culinary landscape of Cleveland is a result of the region’s rich cultural heritage. Much like the vibrant flavors and spices in many ethnic dishes, Cleveland is a melting pot of a diverse group of settlers who originally immigrated to the area for opportunities in thriving industries. The result is approximately 117 different cultures with the history, traditions and, of course, the recipes of their native lands. This entry was posted on October 3, 2012 at 9:14 PM	and is filed under CLEGourmand, culinary knowledge, Ohio, Road Trip. You can follow any responses to this entry through the RSS 2.0 feed. You can leave a response, or trackback from your own site. I would love to visit the Museum of Contemporary Art! Have fun – sounds like a deliciously fun weekend!